As this beloved British cop show returns, the old dogs of the Unsolved Crime and Open Case Squad (UCOS) have a new boss. 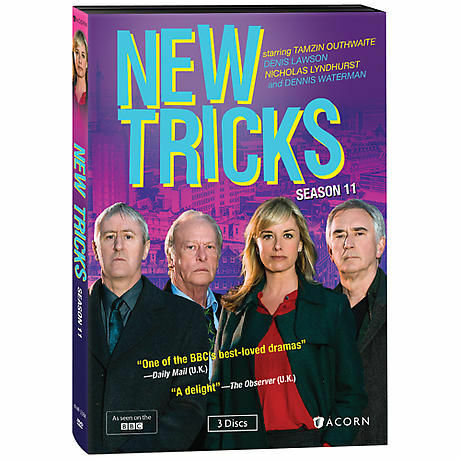 Beautiful young DCI Sasha Miller (Tamzin Outhwaite, EastEnders) keeps a watchful eye on her motley crew of veteran detectives: Gerry Standing (Dennis Waterman, The Sweeney), Steve McAndrew (Denis Lawson, Bleak House), and Danny Griffin (Nicholas Lyndhurst, Only Fools and Horses). Although the show's cast has changed over the years, they still solve daunting cases with classic sleuthing skills and more than a touch of gentle humor. In Season 11, the team tackles crimes involving antinuclear protesters, battle reenactors, an amateur sleuth, illegal immigrants, and state secrets from the Cold War era. Guest stars include Julie Graham (The Bletchley Circle), David Hayman (The Paradise), Amy Nuttall (Downton Abbey), Liz White (Life on Mars), and Phil Davis (Whitechapel). 10 episodes, 3 DVDs, approx. 610 minutes, SDH.